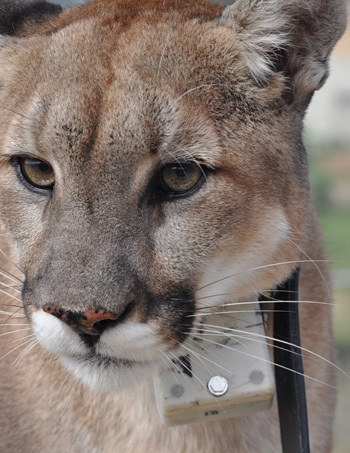 Scientists at UC Santa Cruz, using a new wildlife tracking collar they developed, were able to continuously monitor the movements of mountain lions in the wild and determine how much energy the big cats use to stalk, pounce, and overpower their prey. The research team's findings, published October 3 in Science, help explain why most cats use a "stalk and pounce" hunting strategy. The new "SMART" wildlife collar--equipped with GPS, accelerometers, and other high-tech features--tells researchers not just where an animal is but what it is doing and how much its activities "cost" in terms of energy expenditure. "What's really exciting is that we can now say, here's the cost of being a mountain lion in the wild and what they need in terms of calories to live in this environment," said first author Terrie Williams, a professor of ecology and evolutionary biology at UC Santa Cruz. "Understanding the energetics of wild animals moving in complex environments is valuable information for developing better wildlife management plans." The researchers were able to quantify, for example, the high energetic costs of traveling over rugged terrain compared to the low cost of "cryptic" hunting behaviors such as sit-and-wait or stalk-and-ambush movements. During the actual pounce and kill, the cats invest a lot of energy in a short time to overpower their prey. Data from the collars showed that mountain lions adjust the amount of energy they put into the initial pounce to account for the size of their prey. "They know how big a pounce they need to bring down prey that are much bigger than themselves, like a full-grown buck, and they'll use a much smaller pounce for a fawn," Williams said. 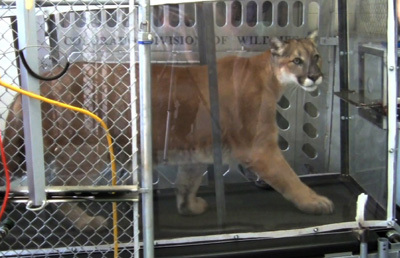 Before Williams and her team could interpret the data from collars deployed on wild mountain lions, however, they first had to perform calibration studies with mountain lions in captivity. This meant, among other things, training mountain lions to walk and run on a treadmill and measuring their oxygen consumption at different activity levels. Those studies took a bit longer than planned. "People just didn't believe you could get a mountain lion on a treadmill, and it took me three years to find a facility that was willing to try," Williams said. Finally, she met Lisa Wolfe, a veterinarian with Colorado Parks and Wildlife, who had three captive mountain lions (siblings whose mother had been killed by a hunter) at a research facility near Fort Collins, Colorado. After eight months of training by Wolfe, the mountain lions were comfortable on the treadmill and Williams started collecting data. According to Williams, the treadmill data showed that mountain lions do not have the aerobic capacity for sustained, high-energy activity. "They are power animals. They have a slow routine walking speed and use a burst of speed and the force of the pounce to knock down or overpower their prey," she said. In addition to the treadmill studies, the captive cats were videotaped wearing the collars while doing a wide range of activities in a large outdoor enclosure. This provided a library of collar acceleration signatures specific for different behaviors, from resting and grooming to running and pouncing. "We got all the different behaviors videotaped and analyzed with the corresponding accelerometer traces," Williams said. Meanwhile, coauthor Chris Wilmers led a team that deployed the collars on wild cats in the Santa Cruz mountains. Wilmers, an associate professor of environmental studies at UC Santa Cruz, leads the Santa Cruz Puma Project, which has been tracking mountain lions in the area to study the effects of habitat fragmentation and developing new technology for understanding the animals' behavior and energetics. "Because mountain lions are a cryptic animal, we can't really observe them hunting and killing prey. With the SMART collars, we can see how they go about doing that, what their strategies are, and how many calories they are expending to do it," Wilmers said. "The ability to estimate the field energetics of animals in the wild opens up a whole new suite of questions we can ask about the ecology of these animals, which ultimately informs not only our basic understanding of them but also their conservation and management." Coauthor Gabriel Elkaim, professor of computer engineering at UCSC's Baskin School of Engineering, worked on signal processing of the accelerometer data and is continuing to develop the state-of-the-art tracking collars. The prototype used in this study, called the Species Movement, Acceleration, and Radio Tracking (SMART) wildlife collar, was developed by computer engineering graduate student Matthew Rutishauser. The collars include a GPS unit, accelerometers, and a magnetometer to provide detailed data on where an animal is and what it is doing. "We hope this will be an enabling technology to allow a much greater depth of understanding of animals in the wild," Elkaim said. The researchers now want to look at mountain lion energetics in a range of different habitat types. In particular, Wilmers said, he is interested in how human land use and habitat fragmentation may be influencing the energetic demands on mountain lions in the wild. Williams and her students also have projects using the new collar technology to study other large carnivores, including wolves, polar bears, and Weddell seals. "A lot of these large carnivore species are threatened or endangered, and understanding their physiological limitations has been a big missing piece in conservation planning," Williams said. "This technology gives us a whole new level understanding of what these animals are doing and what it costs them to live in the wild, and that can really help move the science of conservation forward." In addition to Williams, Wilmers, Wolfe, and Elkaim, the coauthors of the paper include Tracy Davis at Colorado Parks and Wildlife; program manager Traci Kendall and head trainer Beau Richter in Williams's lab at UC Santa Cruz; and UCSC graduate students Yiwei Wang and Caleb Bryce. This research was funded by the National Science Foundation.